This is from Chow, a favorite foodie site of mine! Place all of the ingredients except the oil in a blender and blend on high until smooth. With the motor running, slowly stream in the oil until it is fully incorporated; set the dressing aside in the blender. Cut the bok choy in half lengthwise, rinse it, and dry it. Cut the leaves crosswise into 1-inch-wide ribbons, cut the stalks crosswise into 1/4-inch pieces, and transfer both to a large bowl. Add the remaining ingredients, drizzle with the dressing, and toss to combine. Serve immediately. 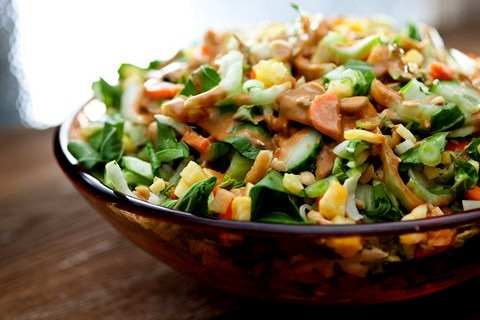 This light and refreshing salad is a loose interpretation of the popular Indonesian dish gado-gado. In our easy version, a spiced peanut dressing is blended until creamy and then tossed with thinly sliced raw baby bok choy, pineapple, carrots, cucumber, cilantro, and scallions. To turn this healthy side dish into a flavorful meal, top it with Shrimp. What to buy: Look for chili-garlic paste in the Asian section of your supermarket. We like the one made by Huy Fong Foods (with the rooster on the jar). Game plan: You can prepare the vegetables a few hours ahead of time and store them separately in the refrigerator. The dressing can also be prepared a few hours ahead, but it may need to be reblended when you’re ready to serve. Make sure to dress the salad just before serving; otherwise it’ll wilt as it sits.